Manufacturing data in the Eurozone showed surprise growth this month, easing recession fears as Spanish unemployment also receded to its lowest level since 2011. Having said that, currency investors are clearly worried that the progress being made is too timid to offer any significant comfort. As a result, the shared currency barely moved against the dollar, ending nearly flat at $1.2646. The US Consumer Price Index reiterated the divergent status between Europe and the world's biggest economy. On this side of the Atlantic, there's a pressing danger of deflation which could well require additional action in the short to medium term. In contrast, the latest figures show that the US has the luxury of time; they can afford to do nothing for a while. 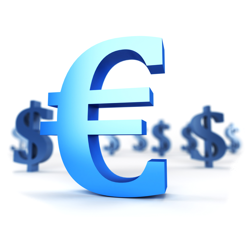 That helped the dollar yesterday, which gained 70 points against the euro to $1.2646. Reports in the financial markets that the ECB was considering buying covered corporate bonds to bolster growth in the common area easily spilled over to the other side of the Atlantic. As a result, the euro dropped by 84 points against the dollar to $1.2716, with participants quick to point out that this might be just the beginning. If we continue to see additional stimulus measures on the cards then the likelihood of renewed weakness in the euro should be taken into consideration. With oil prices in freefall, several Federal Reserve members seem tempted to adopt more of a wait and see attitude with regards to raising interest rates. They can definitely afford the move as economic data indicates that the US is in better shape than Europe, whose short-term problems may be about to escalate. As such the US dollar has stopped appreciating, at least for now, with the shared currency gaining back 45 points to $1.2799 yesterday. With German reluctance preventing the ECB from taking the QE baton, it seems that the Fed might not be in a rush to raise interest rates, with an increasing possibility that they will wait until after mid-2015. Nevertheless, confirmation of a slowdown in European inflation to 0.3% in September continued to push the shared currency lower against the dollar on Friday. The EUR/USD pair dropped 46 points to $1.2760 as the toxic mix of slumping inflation and weak economic growth, which may soon translate into recession, threatens to put Europe under close scrutiny once again. Despite the pressure, German Chancellor Angela Merkel and the Bundesbank are unwilling to blink on the subject of QE. The million dollar question is, for how long?